Kneading is probably the number one thing that discourages people from making bread. 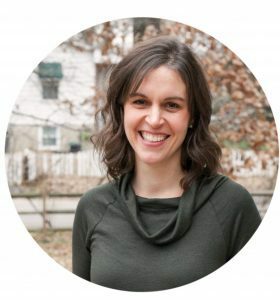 I did write a “How to knead” post, but in case you are still terrified of kneading, I have a recipe that requires no such thing! 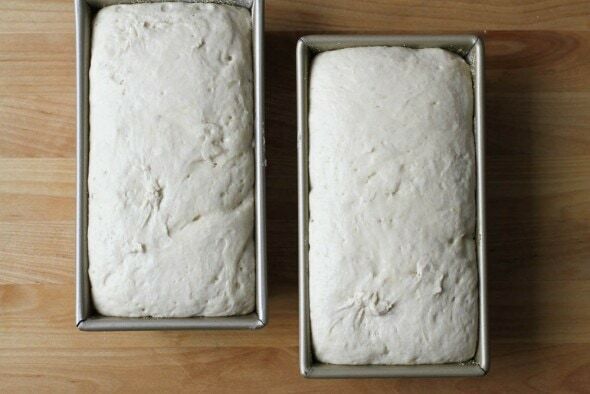 In addition, it only needs to rise one time, so it’s a good first yeast bread recipe to try. You will need a stand mixer, though, because this recipe uses the mixer’s strength in place of kneading. Like English muffins, this bread has a somewhat hole-y texture, and it’s at its best when toasted. 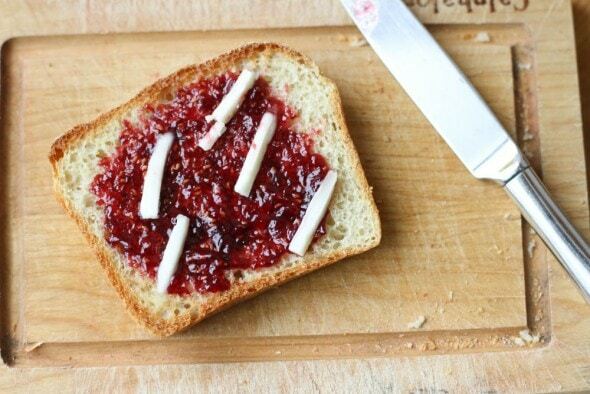 And of course, butter and jam elevate it to heavenly levels. Here’s how to make some for yourself. Heat liquids to 120-125 °F (I do this in the microwave). 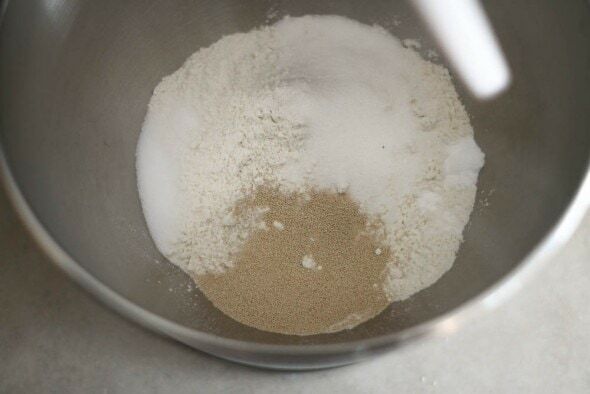 Add warm liquids to dry ingredients in mixer bowl, and mix for 2 minutes. It will be rather runny at this point. Add remaining flour and beat for two minutes. The dough will be quite thick. 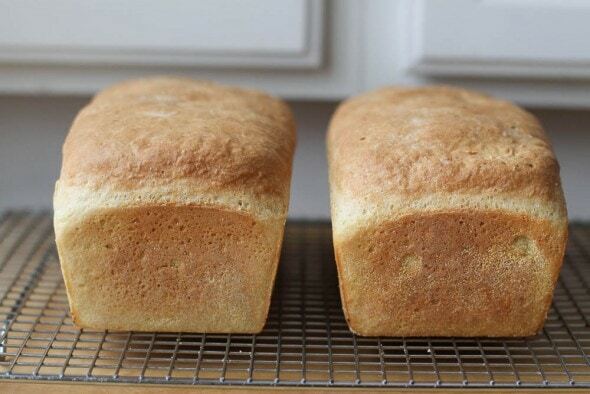 You can use 9×5 inch bread pans, but your loaves will be flatter and a little less attractive. Still tasty, though! I do this the same way that I grease and flour a cake pan…I put the cornmeal in and tilt and shake the pan until it’s evenly covered. 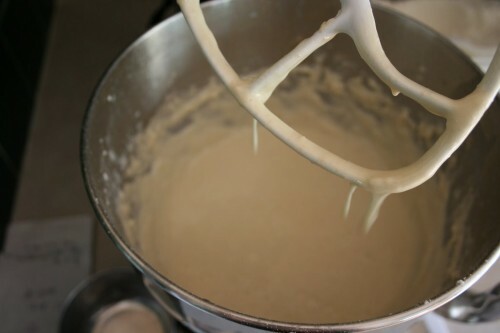 My recipe says to pour the dough into the pans, but this dough is so thick, pouring is an impossiblity! I usually try to roughly divide it in two using a metal spoon, but I normally get it wrong and have to take some dough from one pan and put it in the other. I smooth the dough out a bit with wet fingertips, but you don’t have to worry about it being pristinely neat…the lumps and bumps will straighten themselves out as the dough rises. You do want the pans to have relatively equal amounts of dough, though, or the loaves will need different baking times. 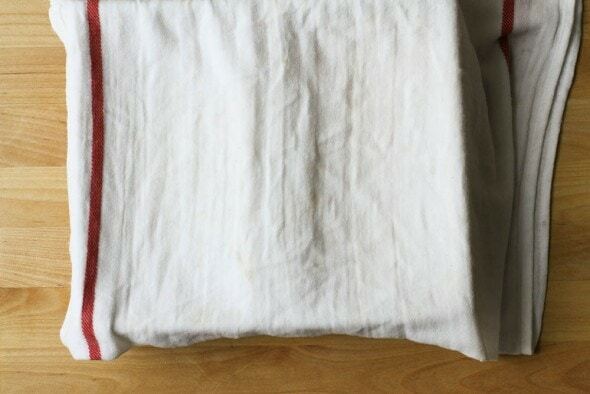 Cover with a wet tea towel (the type of towel that is not fluffy) and let it rise in a warm place for an hour. After rising for an hour, it should look like this. Bake the risen loaves in a preheated 350°F degree oven for 25-30 minutes. Turn the loaves out of the pans and cool on a wire rack. And here’s the inside texture. Because this dough has very little fat and sugar (which are preserving agents), it will only stay fresh for a day or two on the countertop. It freezes well, though, so eat one loaf and freeze the other, because if you need a little something to go with dinner on a busy night, it’s awfully handy to have a loaf waiting for you in the freezer. If you have a small household, another option is to cut the loaves in half and freeze each half individually. That way you only have a half loaf to contend with each time. 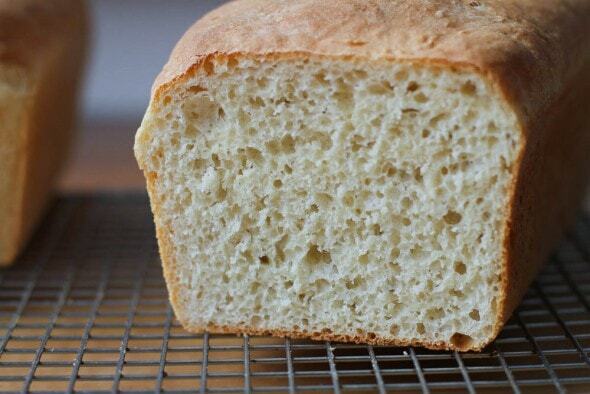 This easy yeast bread requires no-kneading! It's a foolproof, beginner-friendly recipe. Heat liquids to 120-125 degrees; add warm liquids to dry ingredients in mixer bowl, and mix for 2 minutes. It will be rather runny at this point. Add remaining flour and beat for two minutes (dough will be thick). 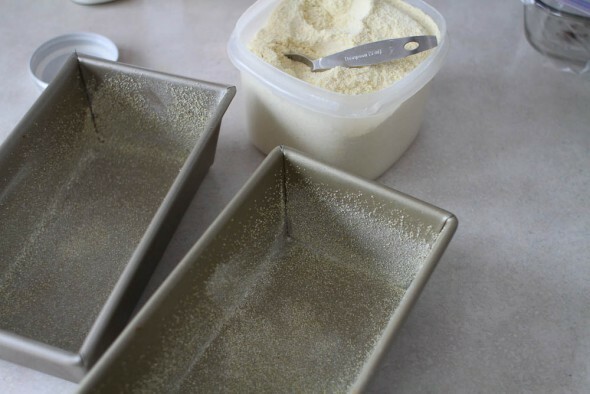 Spray two 8.5 x 4.5 inch loaf pans with nonstick spray and then sprinkle with cornmeal. 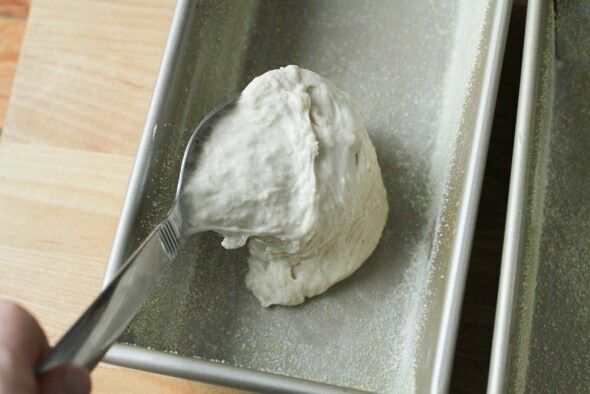 Using a metal spoon, divide the dough evenly between the two pans. Cover with a wet tea towel and let rise in a warm place for an hour. 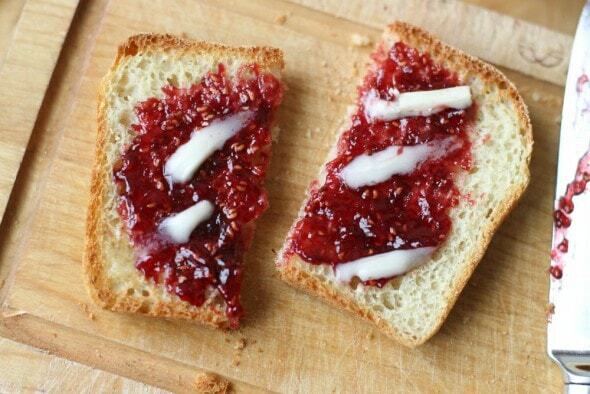 To serve, slice and toast, then top with butter (and jam if you wish). Freeze to keep longer than 2 days. This bread contains very little fat or sugar, which means it doesn't keep long. Be sure to freeze what you won't eat in a day or two. P.S. My favorite bread pans, cooling rack, and mixer are listed in this post. « What I Spent, What We Ate | I have $75 left for April. I love this bread. I got this receipe from you when you posted it on your baking blog. I make it all the time and my kids just gobble it up!!! I am going to give this a try this weekend!!! Rachel, you could SO totally do this. 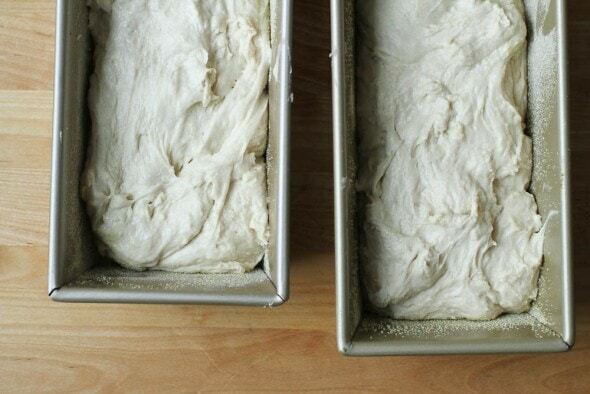 No kneading, no adding flour “just til the dough is right”…it’s practically foolproof. I bet it will turn out great. Whitney, I’m glad you’ve had success with this recipe! And FG, I’m anxious to hear how yours turns out. What mixer do you have? Do you NEED a mixer to make bread? I make this all the time without a mixer, I use the dough whisk from King Arthur flour, it takes a little strength but its totally doable! My recipe, which came from my Mom uses 2 1/2 c milk and 3/4 c water, everything else is the same. I’ve tried it both ways and find this makes a slightly more “holey” bread in the finished product, which I prefer, more room for butter and jam to get stuck! This looks delicious! Will this recipe work for little round individual english muffins? This was excellent! Made it for the first time over the weekend. The kids and hubby devoured it! Thanks for another great recipe! Oh, I’m so glad Jennie! Yay! Valerie, you employ a fairly different method to make real English Muffins. You make a kneaded dough, roll it out, cut it with biscuit cutters, and then you cook them in a skillet. I will eventually post that recipe here. I also noticed it’s not really “forming” like your loaves did. Although it is rising it is keeping all the roughness from when it was originally put in the pans. I am going to try baking it anyway but don’t expect greatness. I guess I should have read the comments before making to know I needed a stand mixer! Hmmmm, I don’t know why that would be! Is it really warm in your house? If it’s especially hot, the bread would rise faster than normal. 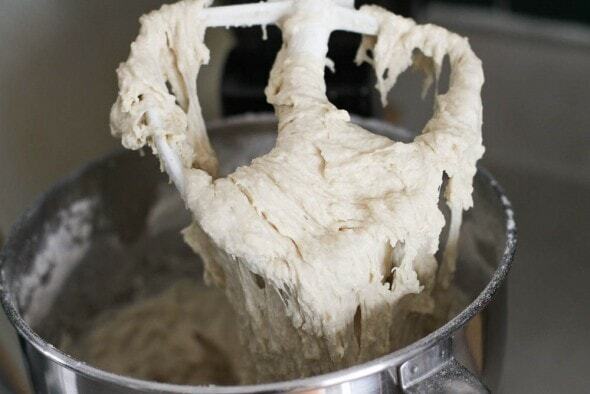 Was your dough as thick as mine before you put it into the pans? Kristen, it did seem like the doughs were about the same consistency. I don’t think my house is warm, the window was open and it was probably upper 60’s yesterday morning. The good news is, either way the bread turned out great. It is definitely bigger than your loaves but the consistency seemed to be about right. And my husband (who eats an english muffin EVERY morning with his breakfast!) said he loved it, so a total winner! Kristen, I made this recipe yesterday and it is just delicious. Toasted with butter and jam made a great addition to breakfast and a yummy snack this morning We’ve also been enjoying your whole wheat bread, the Asian glazed Tilapia and my daughters love your chocolate pudding. They are so pleased I finally found a recipe that tastes like store bought ones. I stopped buying those because of their ingredient list. Actually your recipe is nicer IMHO. Thanks for sharing your family recipes. That’s so awesome! And kudos to you for giving up all packaging…that’s so hard to do. I was wondering if you could recommend an alternative to dusting pans with cornmeal. I am sensitive to corn products . Could I just use flour or maybe a course wheat flour? Thanks. Yep, you could do that, or you could skip the dusting altogether…it’s not essential. Thanks!! Can’t wait to try this! This sounds great. I’ve never been energetic enough to try making English muffins–dumping the dough into pans and letting them rise sounds more appealing than cooking them over a griddle. Would it work to put raisins in, or will they sink to the bottom? This dough is pretty stiff, so I highly doubt they’d sink to the bottom. I’d just mix them in right before you put the dough into the pans. This sounds so yummy, Kristen. We are going to throw a spring tea party brunch this year. This just may make the menu. Going to try this Sunday!! Nice! For anyone who’s scared about kneading, I should say that I’m a former scaredy-pants myself. But, honestly, YOU CAN DO IT! Seriously! And it’s so worth it – FG’s whole wheat bread recipe is seriously the best! Yum!! 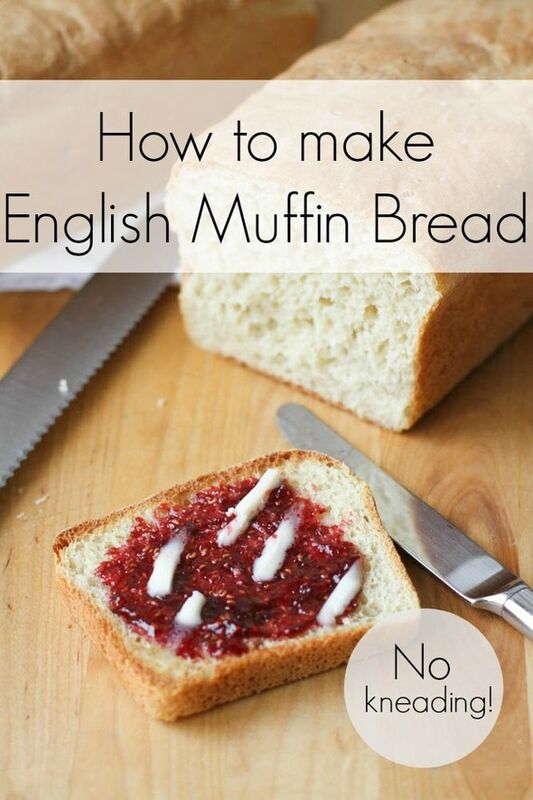 I love making English Muffin bread and have not made it in a while, so this post is a great reminder! Has anyone tried to make this with gluten free flour and xanthan gum? Wonder if it would still turn out. We don’t eat much bread at home these days, but when we did and I made it, I learned to slice the loaf before placing it in the freezer, that way you can shimmy one slice away (with a butter knife is fine) at a time, place it directly onto toaster oven for almost-like-out-of-the-oven bread. Then you don’t have to thaw the whole thing. Highly recommend this for small households too! Will try making it this week….I just bought 25 lb flour to try these types of things. I like homemade items and I know what’s in them so it’s always healthier. The kids don’t even want fast food anymore. If I’m in a hurry and ask if they want me to stop someplace to get dinner, they say no, they’ll wait to get home!! Thank you so much for this recipe! I have been wanting to try one of your bread recipes for a long time, but I’ve been hesitant as I’ve never done it before and don’t quite have all of the right tools. Well I tried this one stirring by hand, and it came out great! It was a great introduction to bread-making and was a big hit with the family, especially since we eat english muffins for breakfast every morning. I am now excited to try out your other bread recipes. Thank you again for the inspiration! Yay! I’m so happy that it worked out for you. Just finished mixing these and putting them in pans to rise (about 20 minutes ago) and I just realized I forgot the sugar. They seem to be rising ok though. Any ideas on what I can do? Should I bake them as muffins rather than bread and sprinkle some cinnamon and sugar on them? They’re in the oven…accidentally sugar free. The sugar isn’t a huge deal in this recipe. 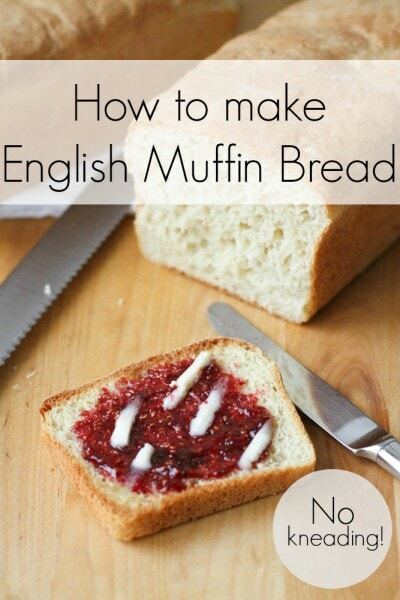 It just gives the muffins a little sweetness and the yeast a little bit of sugar to help it grow. So they’re probably fine without it! I tried to make this recipe this afternoon, and it didn’t rise AT ALL. Followed the recipe to the letter. Is it supposed to use instant yeast? Oh, man! That’s so frustrating, I know. You can use either type of yeast, so that is likely not the problem. Was your yeast fresh? How hot were your liquids? If your liquids were too hot, they could have killed the yeast. I made this and it was awesome! Thank you! I’m always a little intimidated by yeast breads but can’t explain why. Your recipes are so helpful in getting me past that! This is such a great beginner kind of recipe, I think. None of that scary kneading/eyeballing stuff! So glad yours turned out well. First things first: I made a batch of these this weekend and they were delicious. My toddlers kept pulling chairs up to the counter so they could take bites directly out of the loaves. Troubleshooting tips: I ended up with a very dry dough rather than the slightly wet, sticky dough from the photos above. I added milk until the dough started to look ‘right’; for me this was around 1/3 C. The bread still turned out very well, it seems to be a very forgiving recipe. To any first time bread makers, it’s better to end up with a dough that’s a bit sticky rather than too dry! Too much flour will make bread much more dense and dry-textured rather than fluffy and moist inside. This was the first thing I made in my new KitchenAid mixer. Delicious. My dough was fully risen after about 45-50 minutes (77 degrees in the house). When you first posted this, I didn’t have a Kitchenaid mixer or muffin rings. Now I have both. Do you think I could I use this recipe as-is with muffin rings? Obvs the cooking time would be less, but any other thoughts? But I imagine that this kind of dough might work in the rings. I’d definitely be inclined to at least do an initial browning step on a griddle before baking them, though. Otherwise they might resemble rolls more than English muffins. If you try it, do report back!